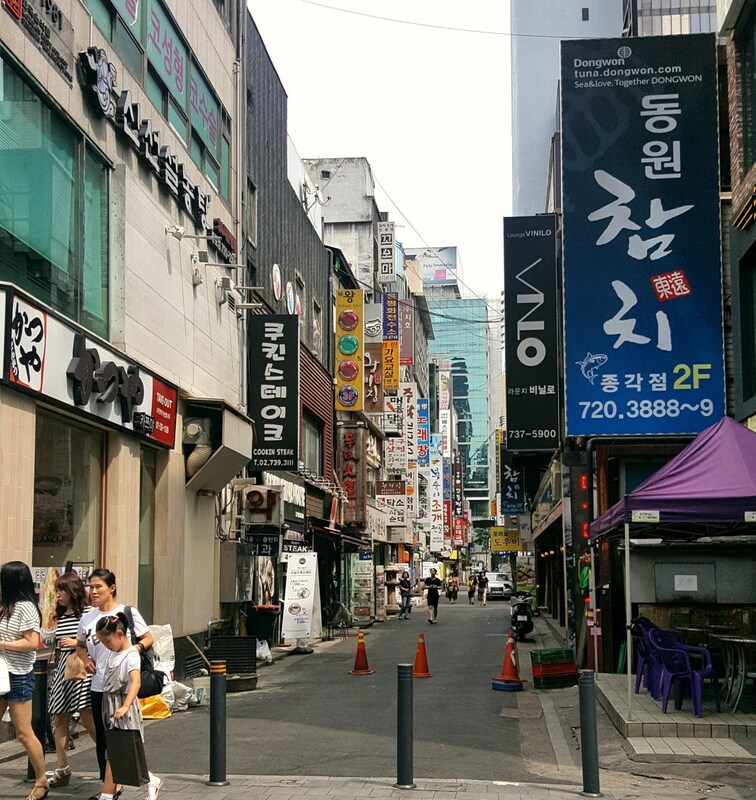 Our final stop was in Seoul, where we were graciously hosted by Mr. Kim, my brother’s wife’s father. 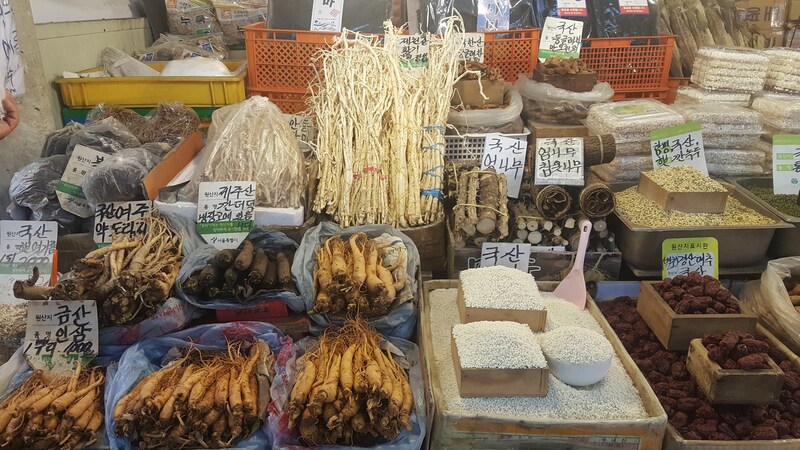 With only two full days, we couldn’t see everything we wanted in Seoul, but here are the highlights from our short visit. 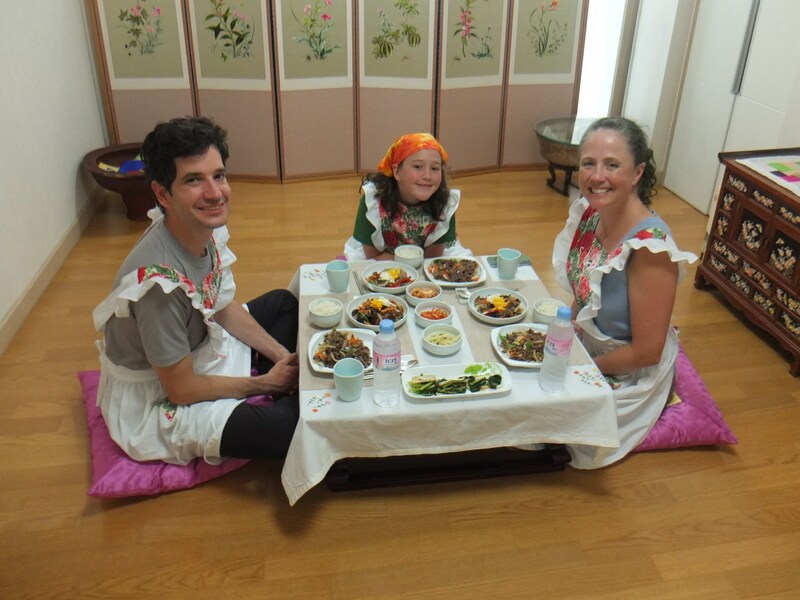 Ruby loved our previous cooking classes so much that we squeezed in one more. 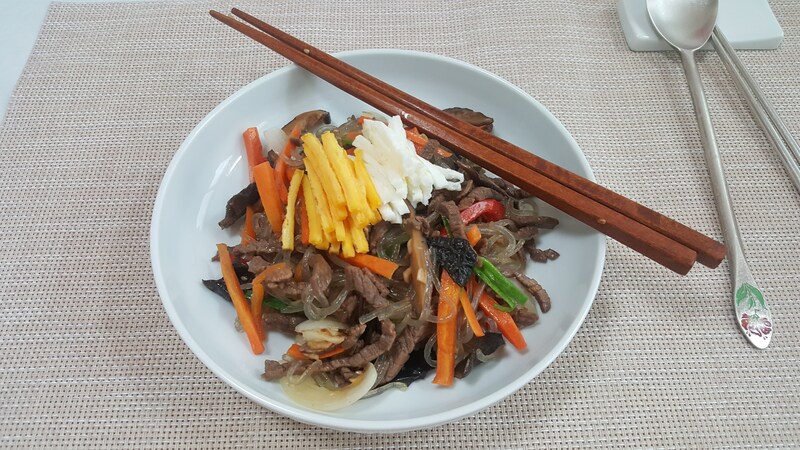 We shopped in an especially airy and clean market, then prepared the Korean dishes japchae and bulgogi. 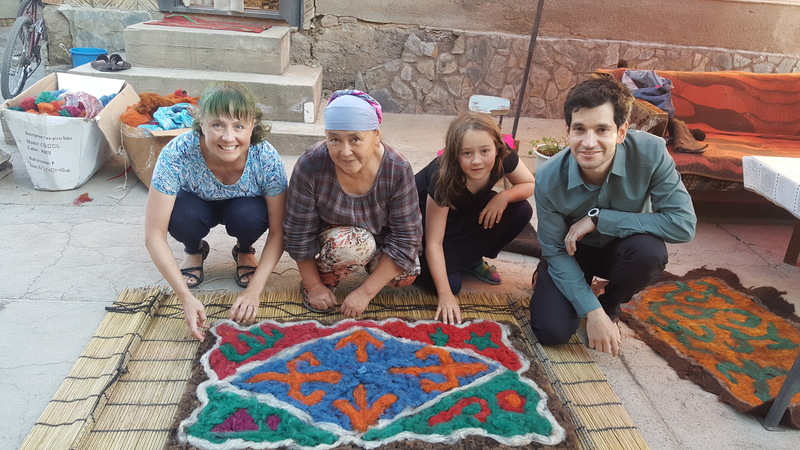 The cooking school was held in an apartment where we were surrounded by beautiful hand embroidery. As in our other cooking classes, we were encouraged to wear silly aprons and ate too much delicious food. 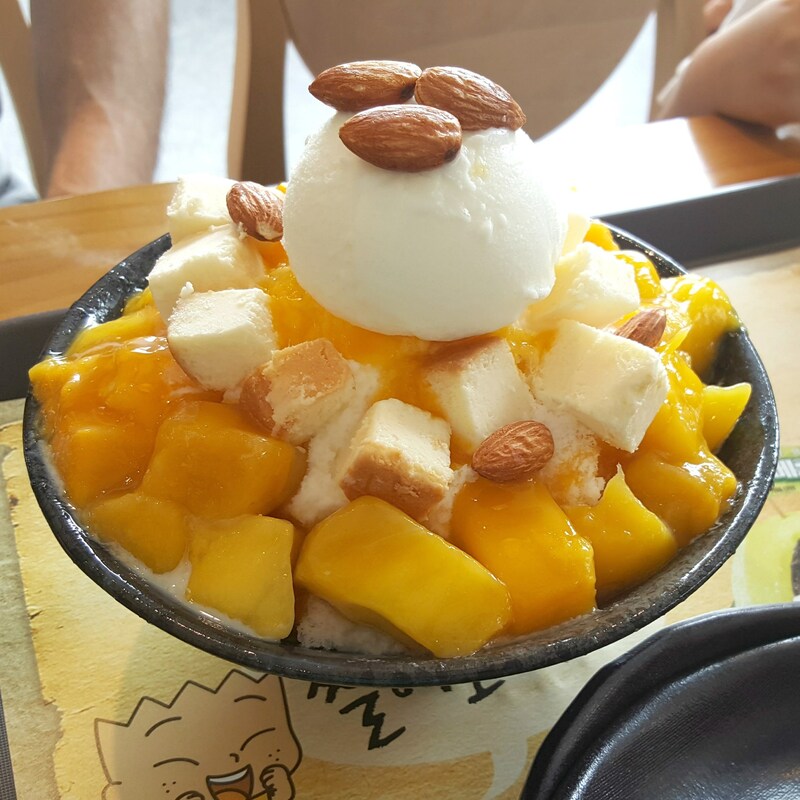 At my sister-in-law Kyoo’s recommendation, we tried aÂ Korean dessert called patbingsoo. 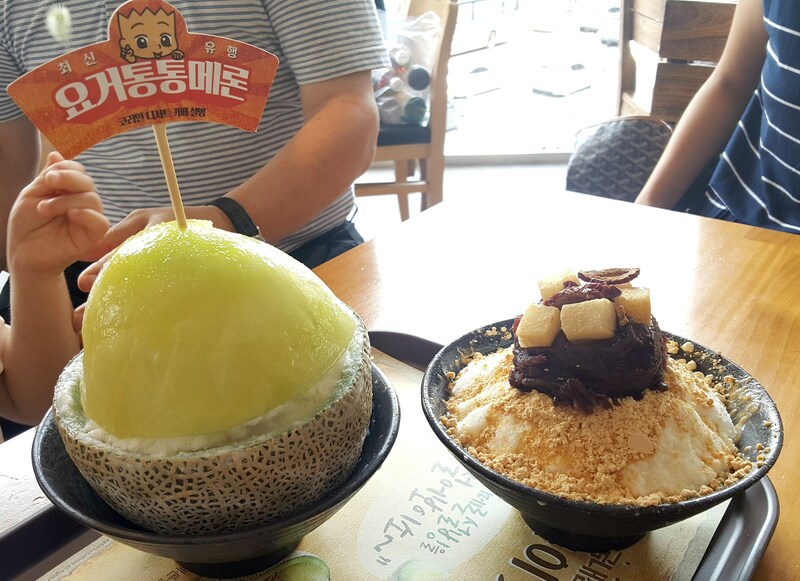 Traditionally, it’s made of finely shaved ice with red beans and condensed milk, but in recent years all kinds of variants have been created. We tried one that had mango and cheesecake pieces, and another with honeydew melon. It was tasty and similar to eating a giant ice cream sundae. 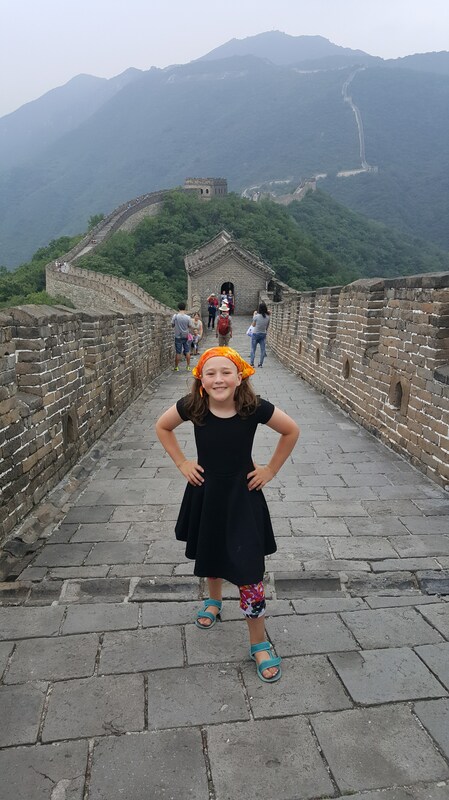 The main goal in China was to visit the Great Wall. 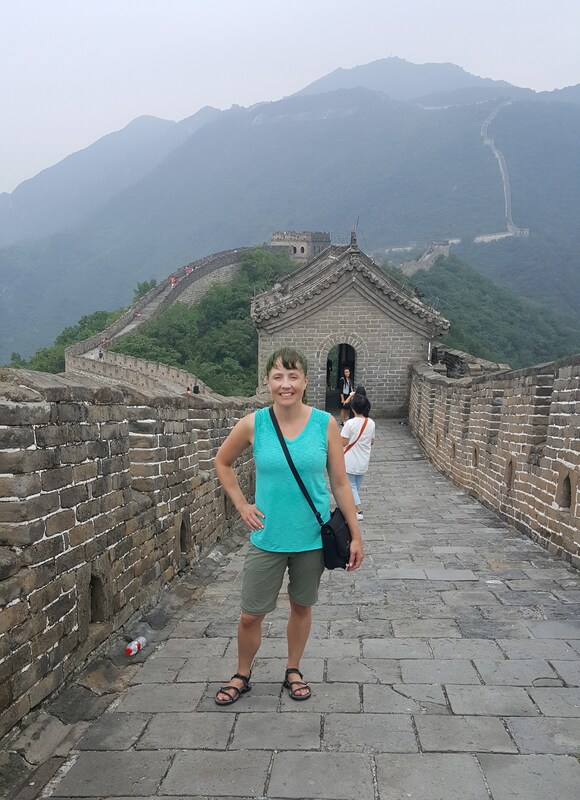 Kate had visited the Badaling section during her previous trip to Asia, but I’d neverÂ been, so we scheduled a few days in Beijing. 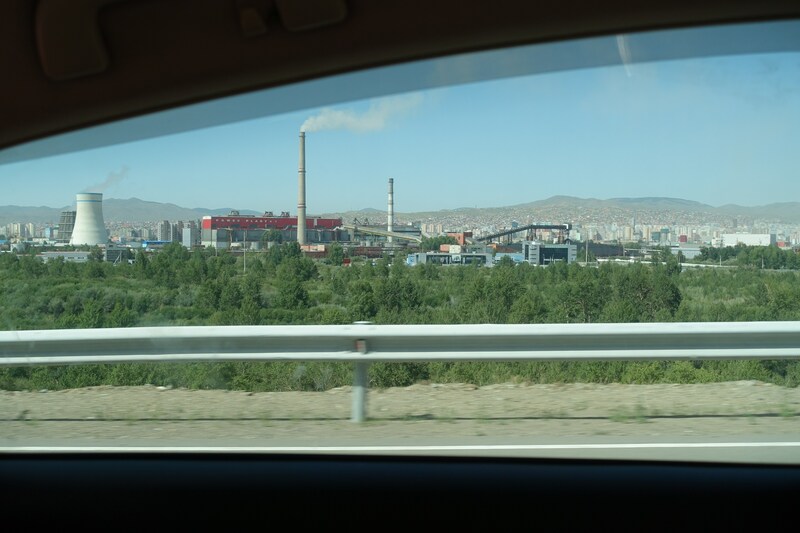 Originally we plannedÂ to see other sights like the Forbidden City, but that changed when we cut a day to stay longer in Kyrgyzstan. Ultimately the only thing we did was visit the Wall, but it was interesting enough to be worth it. We visited theÂ MutianyuÂ part of the wall. This section has been restored recently, butÂ thatÂ didn’t detract from the incredible views and majestyÂ of the site. This is still a giant brick wall built on top of a mountain, and it’s impossible to see it without imagining the massive effort that originally put it there almost 1500 years ago.Â IfÂ you get bored thinking about that, you can look both directions and imagine thatÂ the 2.2 kilometers youÂ see is 0.03% of the 6000 kilometers of wall, and that’s enough to make any mind boggle. 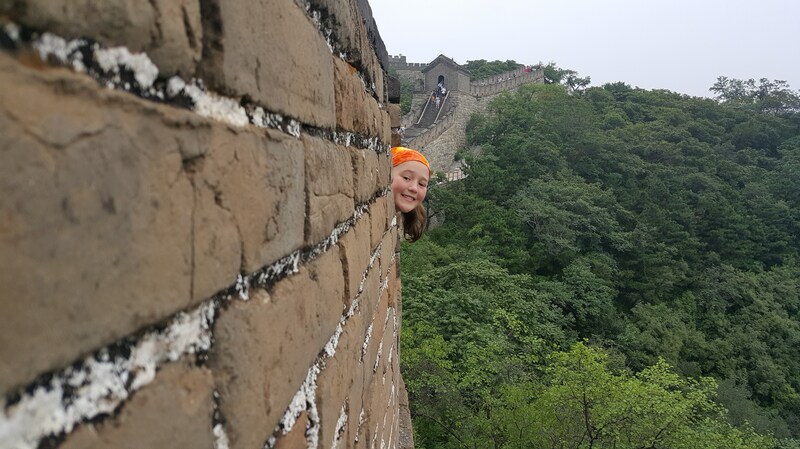 When we arrived at the wall, I headedÂ west to the unrestored Jiankou section, while Kate and Ruby stayed in the Mutianyu area. 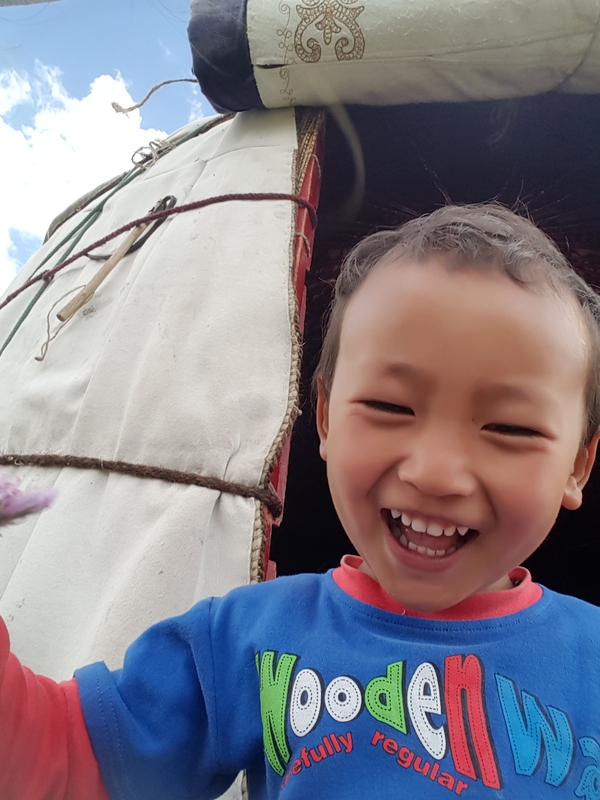 Visiting Mongolia feltÂ like a homecomingÂ for Kate. 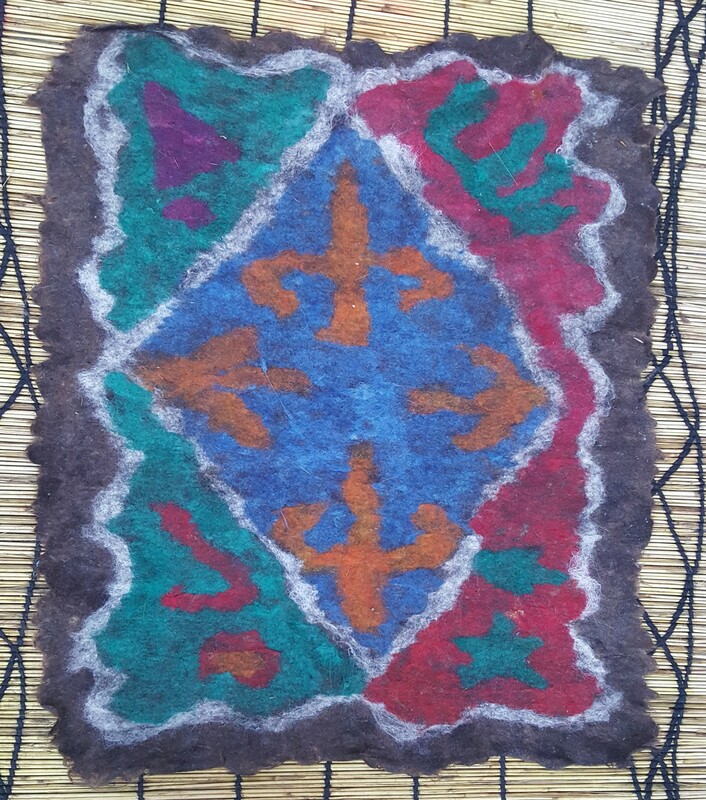 She spent 2 weeks there in 2004 and had been itchingÂ to return ever since. Ruby and I were excited to relive those memories with her and create our own. 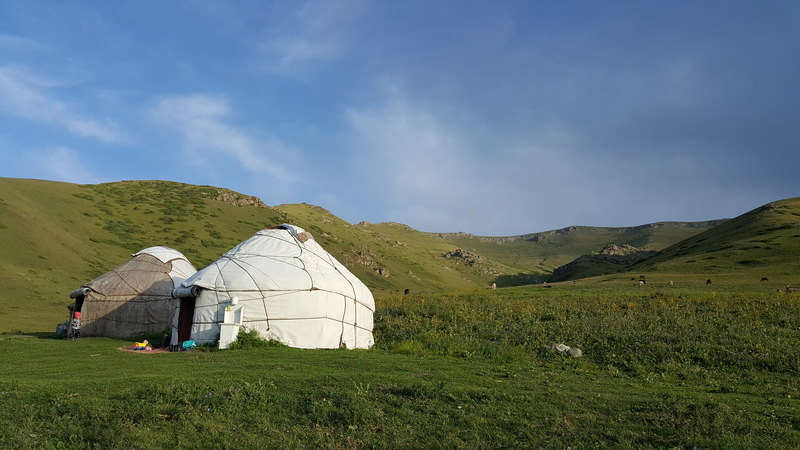 Since we only had 5 days, we couldn’t visit some of the more remote places like KarakorumÂ or the Gobi desert, but we made the most of our time by visiting two very different areas near capital city Ulaanbaatar. 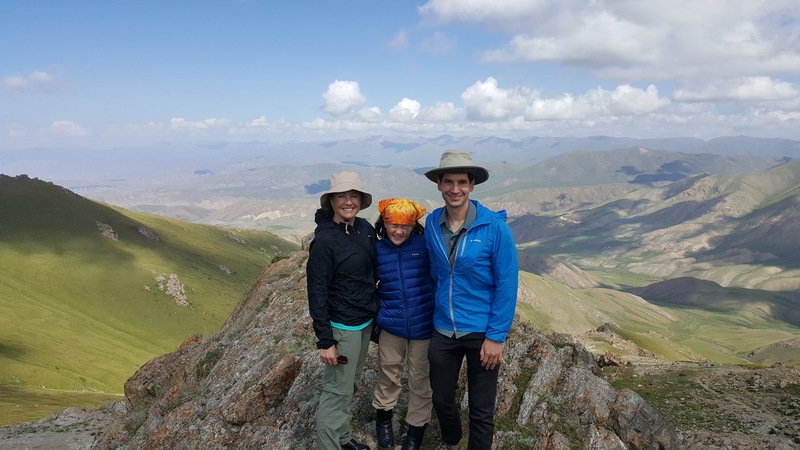 After a day in Ulaanbaatar to adjust to the new time zone, we drove west toÂ Khogno Tarna National Park, locally referred to as “mini-Gobi” since it includes a small sand duneÂ separate from the actual Gobi desert. 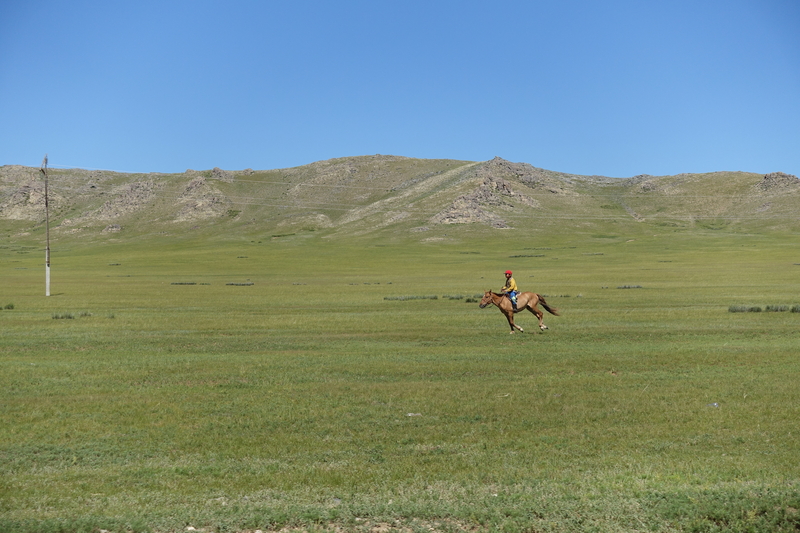 The dune is right off the main highway so it’s a popular tourist destination for foreigners and Mongolians. 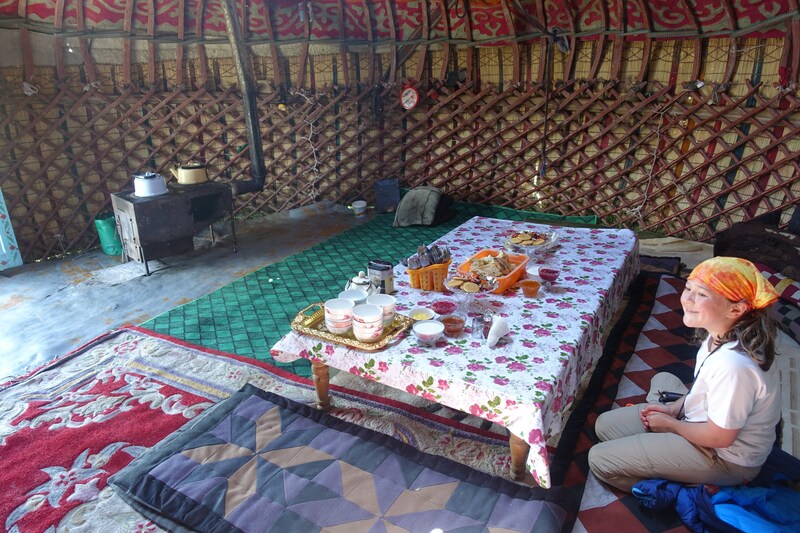 Upon arrival we relaxed for a bit in the ger of local camel herders, sampling their airag (fermented mare’s milk) and aaruulÂ (rock-hard camel cheese). 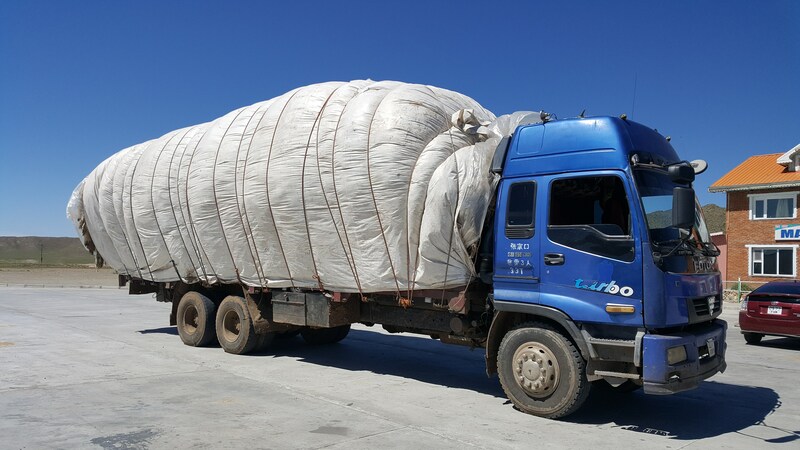 I found the Mongolian airag smoother and less strong than the Kyrgyz version (kumus). It has a unique taste, like fizzy yogurt or yogurt beer. 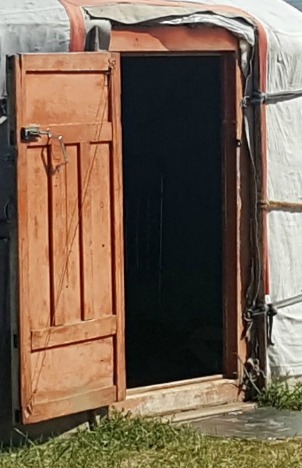 In Kyrgyzstan the nomad tent is called a yurt, andÂ in MongoliaÂ the nomad tent is called a ger. 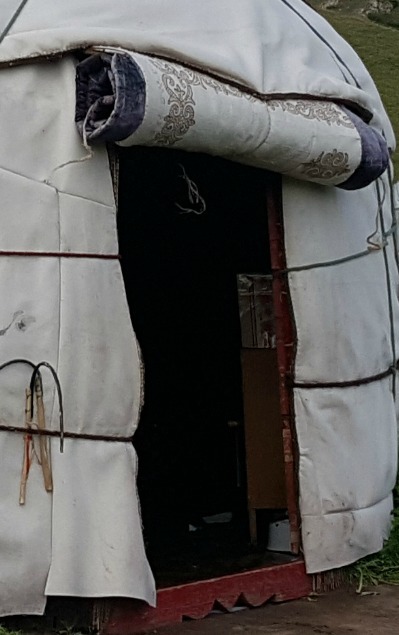 Try to find the differences.Â FirstÂ columnÂ is ger,Â second columnÂ is yurt. 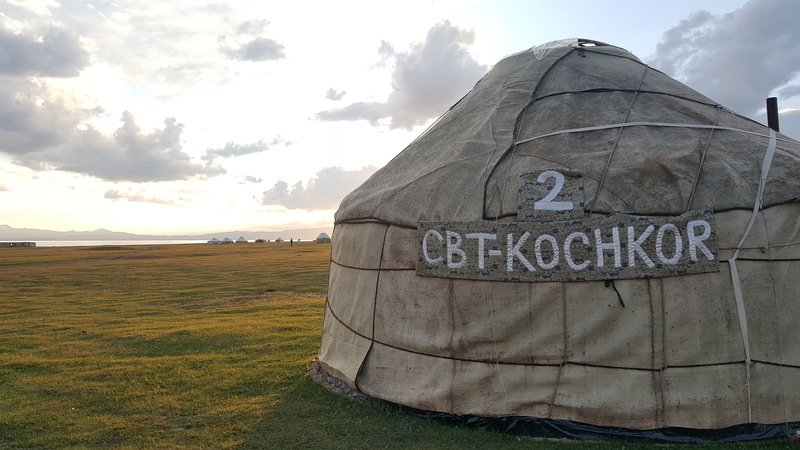 Kyrgyzstan exceeded my high expectations, and I really enjoyed our time there. 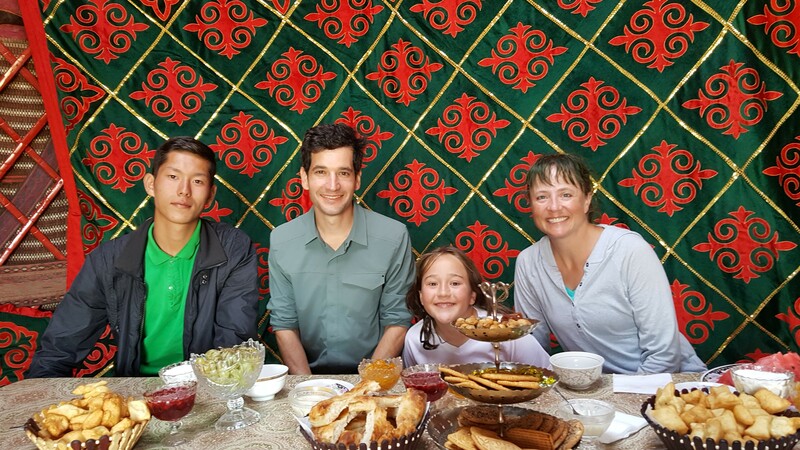 We stayed in Bishkek, the capital, for two nights at the beginning and end of our visit, and spent the rest of our time out in the countryside with our guide/translator Azis. 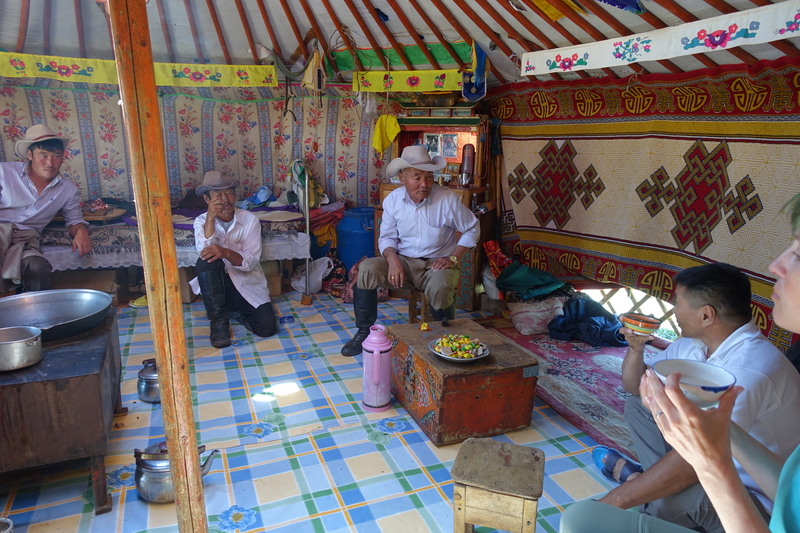 He’s from the village of Kochkor and gave us countless insights into Kyrgyz culture. 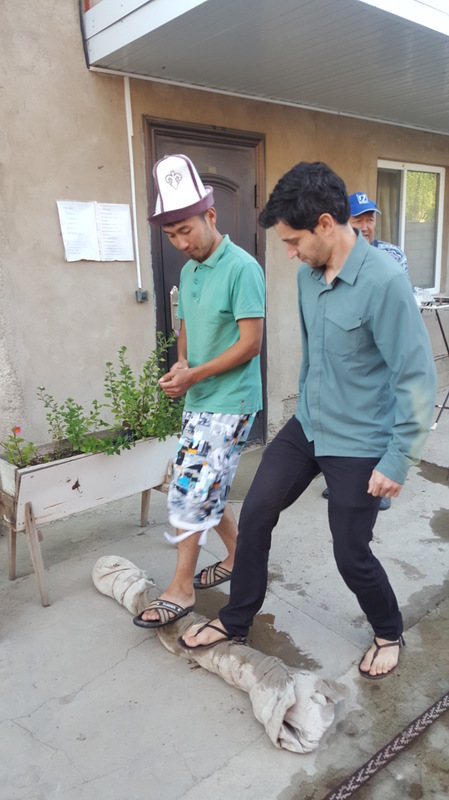 We spent a whirlwind day in Bishkek buying boots and warmer clothes, then drove to Kochkor, where we stayed at Azis’s family’s homestay. 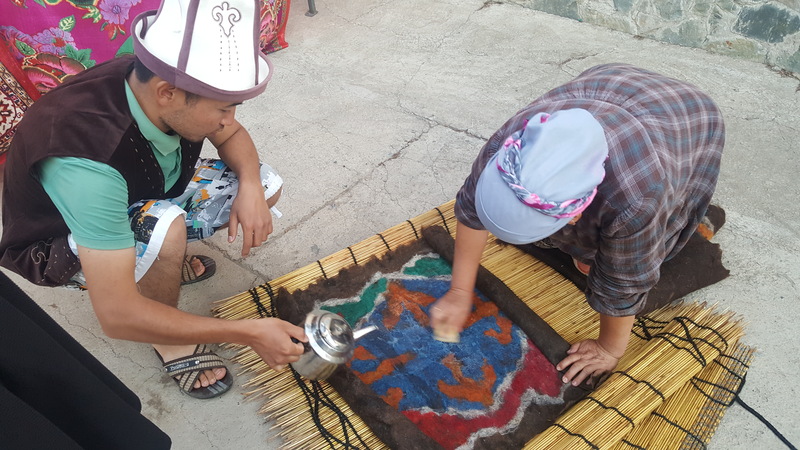 There, we got to help make a traditional felt rug with his parents. 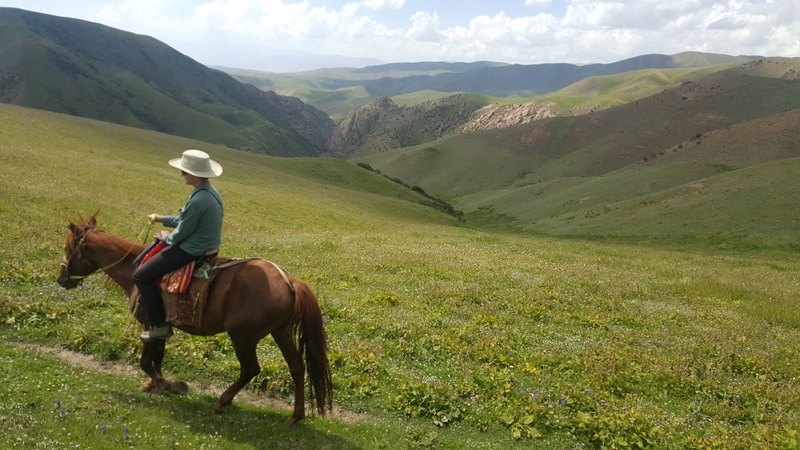 We took a two-day horse trek from a place near Kochkor over a couple mountain passes to Song-Kol Lake. 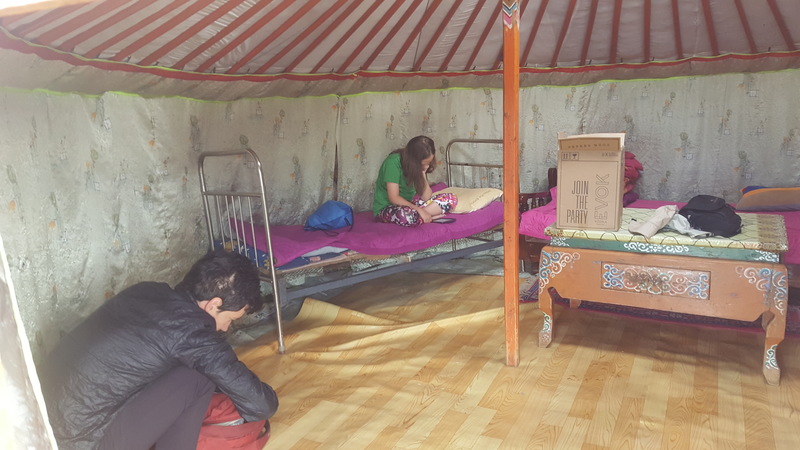 We stayed with a nomad family in the middle, and after getting to the lake we stayed an additional day and night relaxing at a yurtÂ camp. 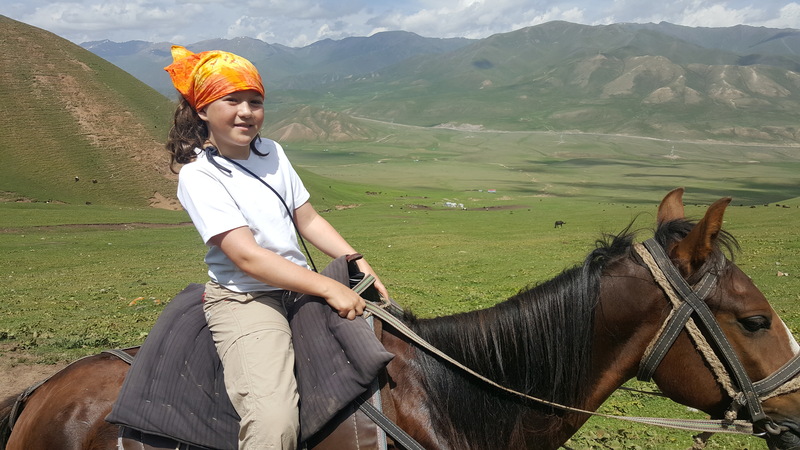 Being on a horse for five hours a day, two days in a row, was a little hard on our backsides. We enjoyed it anyway, and had fun getting our horses to a gallop by the end. 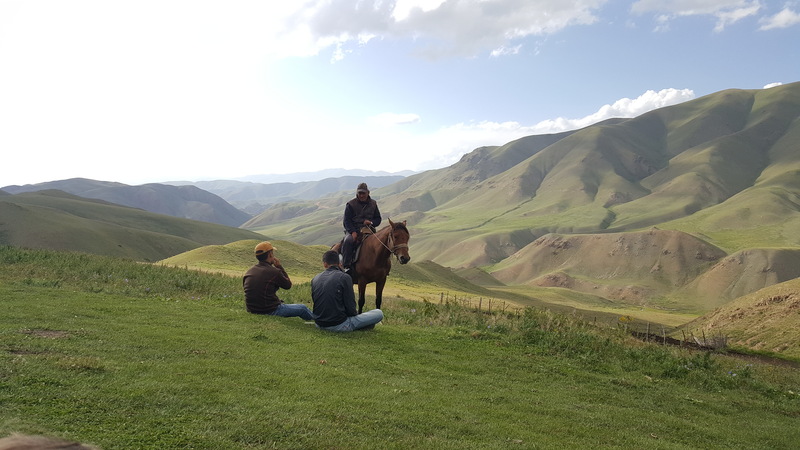 The landscape was astoundingly beautiful – the best of the trip, in my opinion. 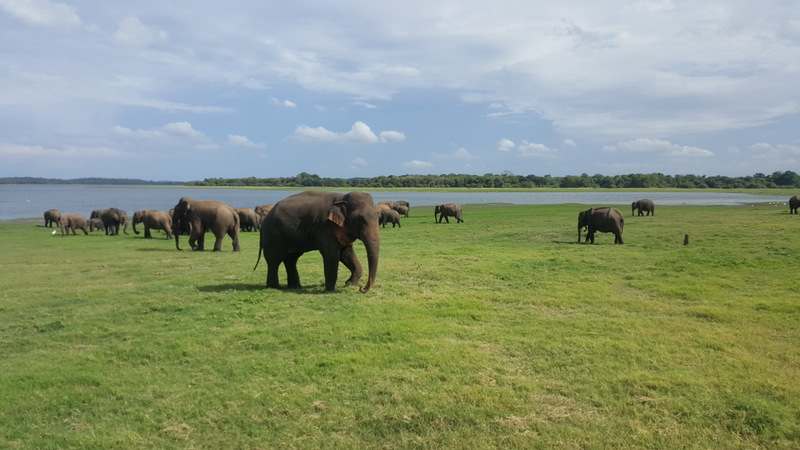 Sri Lanka began as just a layover between Indonesia and Kyrgyzstan, but I quickly got excited about what we could see there and our planned visit grew by a day here and a day there until it became sixÂ days. It still felt rushed, and I’d recommend more time. 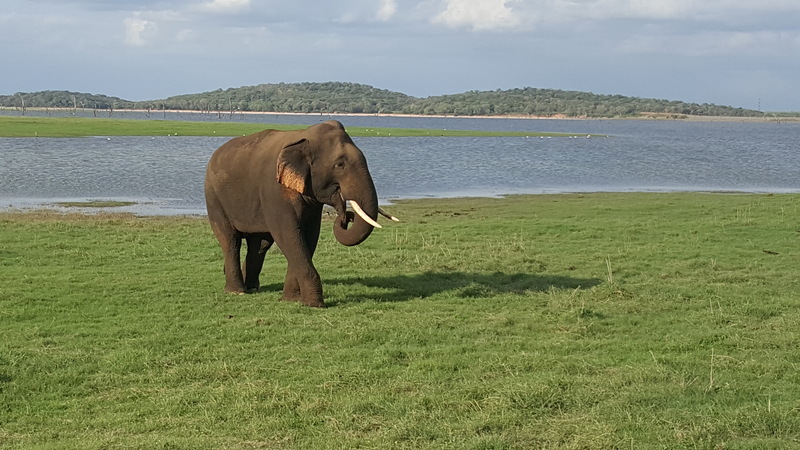 In the dry months, hundreds of wild elephants from all over Sri Lanka gather at two massive lakes in this area because most other water sources are dried up. The gathering spans two national parks, Minneriya and Kaudulla. The best park to visit depends on the day, and where the elephants have chosen to wander. 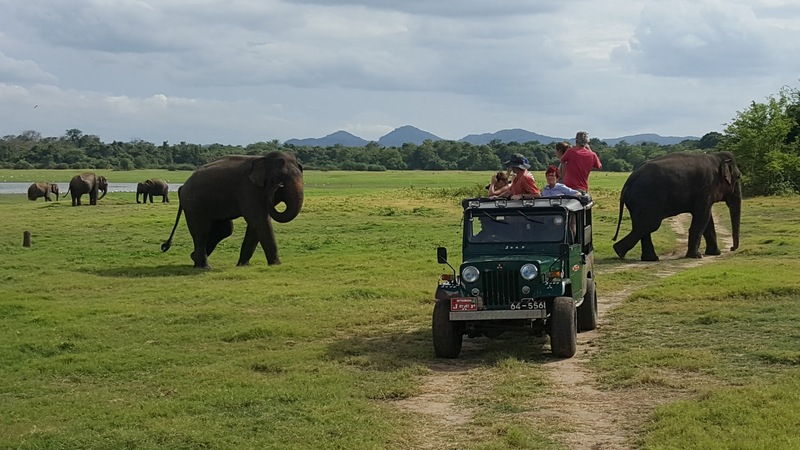 From the town of Polonnaruwa, our home base for wildlife viewing, we joined a group of 4x4s in Kaudulla park. 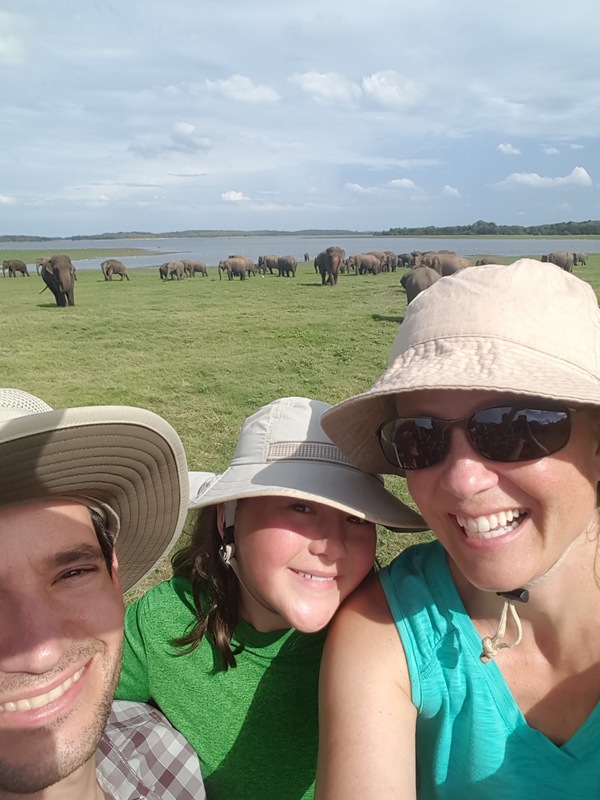 We saw an incredible number of elephants (our estimate: ~150 across several herds). It was a little mind-bending to remember that they’re completely wild and are there simply because they want to be. Indonesia was a specialÂ destinationÂ for us because we were joined by Steve and Sarah, Ruby’s father and stepmother. 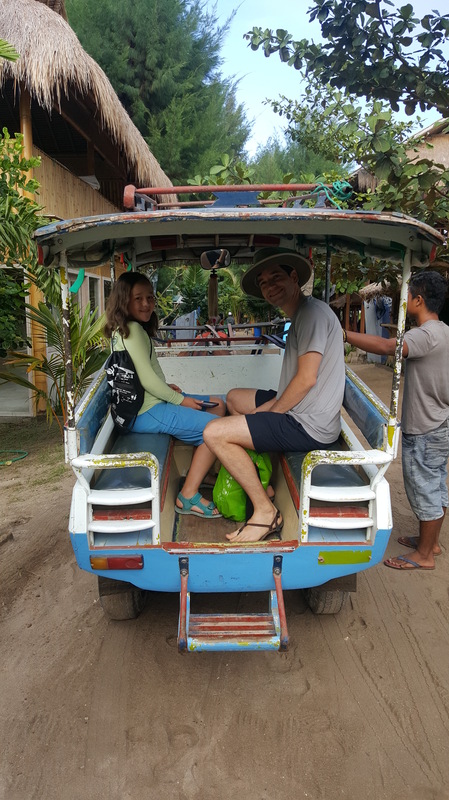 We had a great time traveling together.Â Sarah had lived in Indonesia several years ago and was still conversational in the language, which proved very helpful. Our first destination was Gili Air (literally “Water Island”), one of three small islands northwest of Lombok. Circumnavigating Gili Air on foot takes about an hour, and no motorized vehicles are allowed, only horse carts and electric scooters. I’ve mostly been doing posts about what I’ve done, but this time, I’m going to try something new. 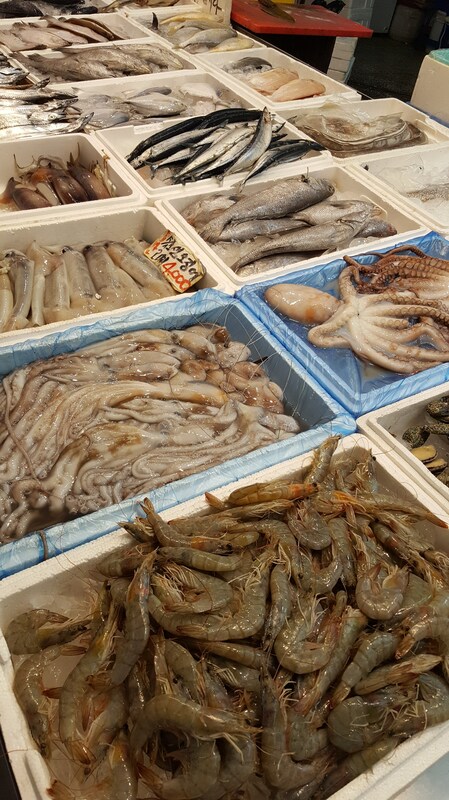 I’m in Sri Lanka now. It’s quite cold, and we went to a tea plantation today. 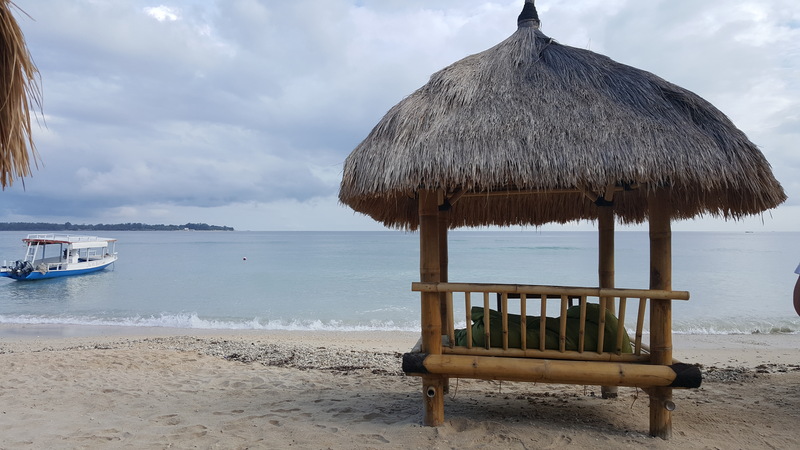 For 3 days we were in Gili Air, which is in Indonesia. 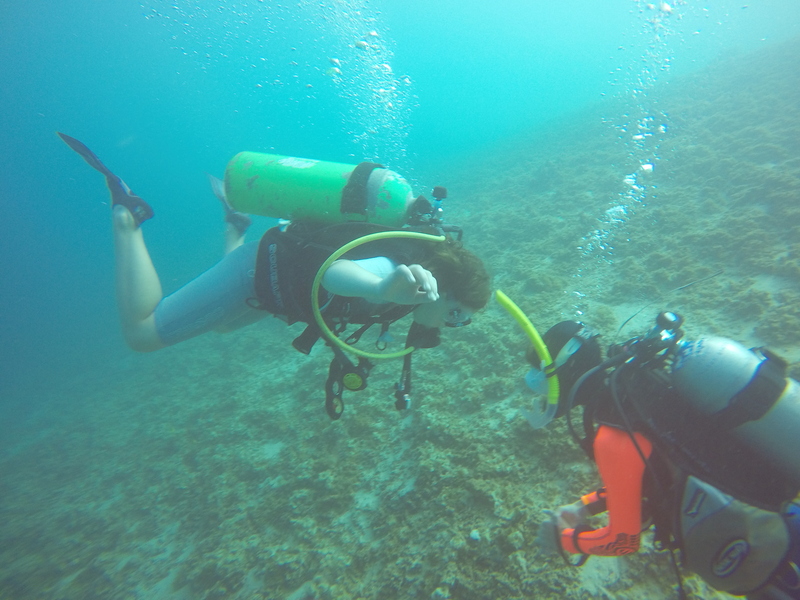 The best thing I did was taking scuba diving lessons. I had to train in the pool first, so I could learn emergency techniques, like clearing my mask, what to if someone runs out of air, and what to do if you lose your regulator. 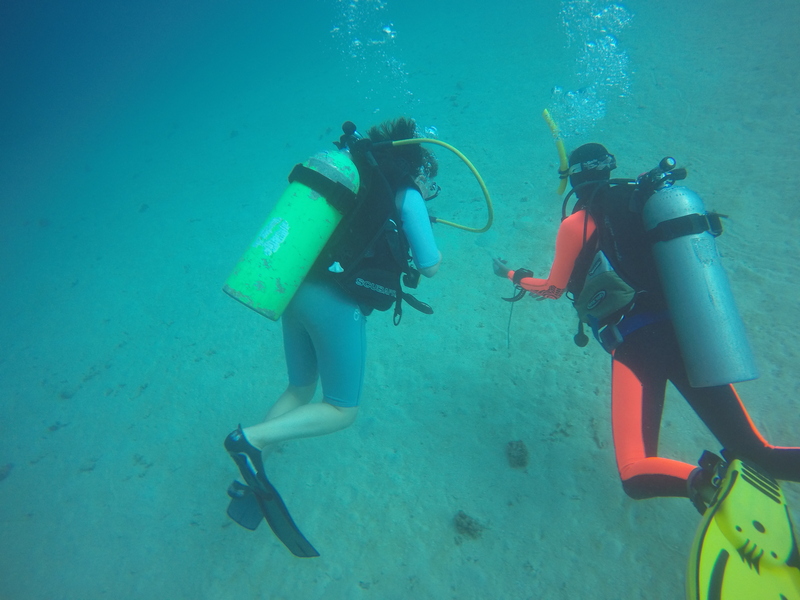 But the best part was after lunch, when we went on a dive to Hans Reef. We saw four turtles, and other cool marine life. The lady with the orange stripes is our instructor, Liz. Here are our diving videos: video 1, video 2. NOTE FROM KATE: Â If you’re following along in our online photo album, please note that we started a new one when we got to Indonesia because the page was getting too long. There’s a link to the new album in the blog sidebar, or you can click this linkÂ to go right there.